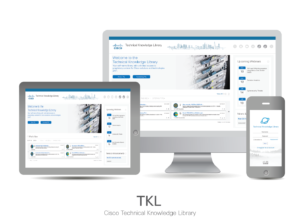 Cisco Technical Knowledge Library (TKL) is an annual subscription service that gives your IT staff unlimited access to proprietary content for Cisco solutions and technologies 24 hours a day, 7 days a week. Use its resources to avoid common problems and reduce your learning curve on Cisco products and technologies. Subscriptions starting at $2,300 per year. Ask about enterprise volume pricing. Where do you go when you need expert guidance? Get the most up-to-date information from experts who work with the same systems and technologies? Take advantage of the expertise they’ve gained working with companies around the world? Access this information online, any time, anywhere, on any device? Help your staff continue learning and achieve Cisco certifications? Explore how TKL can help you find the answers. Click to learn more about each feature. TKL aggregates in-depth information from Cisco engineers to give you access to just-in-time information on the latest trends in technology. Targeted technical webinar events covering a variety of topics delivered by industry Cisco experts. Full Cisco Press library available in digital format. Comprehensively tested and documented guides by Cisco engineers to ensure faster, more reliable, and fully predictable deployments. Checklists and readiness templates to support a smooth rollout and deployment of IT projects. Technical tips, presentations, and other self-study resources to keep up-to-date on new technologies. Cisco recommended design documents detailing the physical and logical requirements. Video on Demand (VoD) and presentations created by Cisco experts and employees. A web file repository designed to share content such as WebEx sessions and meeting minutes between your team and Cisco. Access and review customer test cases and acceptance test procedures to support your projects. IntelliShield security feeds providing continuous, comprehensive, and actionable threat and vulnerability updates. Supplemental Cisco certification information including technology specific, on-demand courses. I love the TKL site, and it has helped me greatly with both my daily work as well as working towards achieving certifications. Excellent resource tool providing latest events materials, training materials, and product specific documentations in one centralized repository.